One of the best defense against flu or other infections is to wash your hands often. Cross your fingers -- and wash your hands. This week may be marking the start of a decline in the annual flu season. 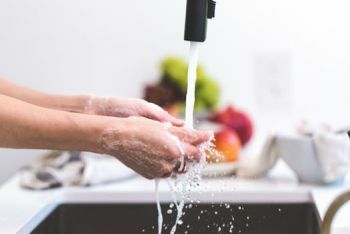 Kim Schneider, RN, Infection Control Preventionist at Reid Health, says the health system’s statistics show a high of 244 cases last week after an increase that began trending upward near the end of February. So far this week, only 104 positives have been logged by Reid Health and the Reid Health Physician network. “I would say this season is not as severe as last year,” Schneider said, noting that at the same time last winter 1,678 patients had tested positive, compared to 1,161 this year. “It is not too late to get your flu shot. With flu activity in the state still high and widespread, it could still help you,” she said. If you get sick, limit contact with others. The Centers for Disease Control recommends that you stay home for at least 24 hours after your fever is gone except to get medical care or for other necessities. Also, if the doctor prescribes antivirals, be sure to take them. If you show signs of the flu, depending on severity, consider a virtual urgent care visit using the Reid HealthNOW mobile app, see your family physician, or visit an urgent care to see if antiviral medication is appropriate.